Handling stress poorly can negatively affect your well-being, but the good news is that you can learn the 10 ways that mentally strong people deal with stress and start using these techniques today. Stress that is unmanaged can lead to physical health problems like high blood pressure, but can chronic stress can also develop into depression, anxiety, and substance abuse. 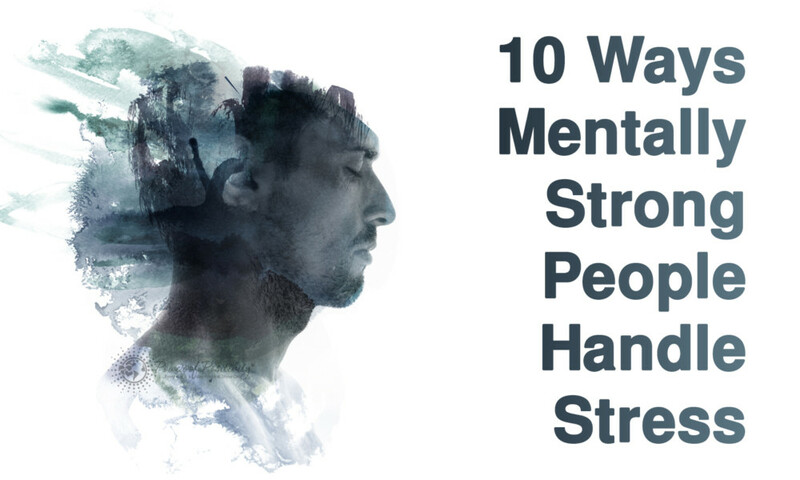 Rather than continue to handle stress poorly, let’s look at the 10 ways that mentally strong people handle stress effectively. We all know that things are bound to happen to upset even the most planned out day, but mentally strong people acknowledge this up front. There is going to be something unplanned for that happens to you, but you can begin planning for it now. Tell yourself now that although you know something stressful may happen today, you are prepared to handle it. Researchers in the Journal of Occupational Medicine studied workplace stress management programs and found that one that included goal setting, problem solving, identifying and questioning negative thoughts, relaxation, and time management was helpful for people to handle stress effectively. This strategy of using multiple techniques to handle stress is one that mentally strong people employ all the time. Mentally strong people look at what is causing the stress and look for ways to prevent it from happening again. By making changes in their environment, they can avoid or reduce causes of stress. Much of our perceived stress comes from not having enough time to get done what we want to get done. By planning ahead for lost time, we can make sure that we have enough time in the day for everything, without being stressed when something does inevitably delay us. For example, if you have a full schedule and worry about being late to your next appointment, next time book your day with 20-30 minute gaps of time in between appointments. That way if there is too much traffic, the delay won’t seem as stressful to you due to the extra time that you planned in to your day. Researchers studying how people handle stress found that a strong social support network was linked to mental well-being. Some people find it challenging to ask for help because they like to be self-reliant. We all need help at some point, so being able to recognize when you have reached a significant stress-level and ask for help to get yourself back to a calm state is an excellent skill that mentally strong people use to handle stress. The same study that showed that social support helped mentally strong people to handle stress found that if they used the technique of avoiding things that they thought of as stressful, their mental well-being decreased significantly. Avoiding is just a way of delaying handling stress. Running away from a problem never solved anything so choosing to face your worries and acknowledge the uncomfortable feelings while using another coping strategy is better for your mental strength. Thoughts come and go and some are terribly negative. Our awareness of our negative thoughts about stress is an excellent skill to have. This mindfulness can then be taken to the next level. Rather than avoid or repress negative thoughts about stress, see them as temporary mental events that will be gone fairly soon. This is a strategy called ‘decentering’ by psychologists, where we challenge negative thoughts. We can choose to accept our negative thoughts as fact, or we can acknowledge that we were making a bigger deal than we needed to about the stressful event, and allow that thought to pass away from our minds like a cloud. This one stressful event is not going to change the course of your life all by itself. You are still a fantastically talented, creative and intelligent person who just had a negative experience. Mentally strong people know that although the surface of the ocean is turbulent, deep down it is calm.